To the farmers who grow our food, the harvesters who pick it, the transporters who bring it to market, the grocers who present it, and the cooks who prepare it. Living God, you are the Creator of this beautiful and fertile world. You made sun, rain, soil, air, seed, and seasons. We praise you for the green of lettuce, the yellow of lemon, the orange of a tangerine, and especially for the bright red of a tomato. They are beautiful to our eyes, delicious to our taste buds, and nourishing to our bodies. We pray to the Lord, Lord, hear our prayer. We thank you, Lord, for this grocery store. We thank you for the many ways Publix serves the community. We thank you for the employees who stock shelves and wax floors and serve as cashiers and help elderly people load their groceries into their cars. We thank you for the founder of Publix, George Jenkins, who said, "Don't let making a profit stand in the way of doing the right thing," and we thank you for Ed Crenshaw, his grandson, who wants to be guided by his grandfather's example. We pray to the Lord, Lord, hear our prayer. Lord, we're here today to pray for the hard-working people who harvest the tomatoes over in Immokalee. You know how hard they work in the hot sun. You know that they only get paid about 50 cents for every 32 pound bucket of tomatoes they pick. You love each farmworker and know each one by name, and you want for them what you want for every hard-working person: a fair wage for hard work. We pray to the Lord, Lord, hear our prayer. We're also here today praying for Ed Crenshaw and all the associates of Publix. We're asking that you will move their hearts to raise the pay for the tomato harvesters by just one penny per pound. We know that Publix is the largest company in Florida, and that Publix's revenue was 25.3 billion last year. We know that even in this tough year of recession, profits are up 9.5 percent this year. So we know that just a penny per pound of tomatoes is something Ed Crenshaw and the whole Publix community could get behind and could actually be proud of. And so we pray to the Lord, Lord, hear our prayer. You are the God of compassion and fairness. Guide Ed Crenshaw to be a man of compassion and fairness like his grandfather. 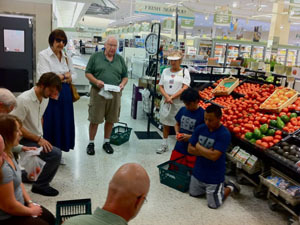 Guide the associates of Publix not to disappoint us customers who feel connected by the food we eat both to them and to the hard workers of Immokalee. And guide the Immokalee workers who are going to visit Mr. Crenshaw soon, traveling by bicycle to Lakeland. Give them good success in their visit. We pray with faith, hope, and love in our hearts, Lord, remembering Jesus' words that your will would be done on earth as in heaven. And all God's people said, "Amen." And if this inspires you to some local creative actions of your own ... that's great.